Janel Nguyen Awarded Garden Grove League "Female Athlete of the Year"
Nguyen is well-known to anyone who has recently attended a Bolsa Grande track meet; she is recognized for her record-breaking numbers in the 100 Meter, the 200 Meter, and the long jump, and is easily spotted leaving competitors behind in distant second. Nguyen currently holds three league records; with a time of 12.45 in the 100m, a time of 25.88 in the 200m, and 17'8.5" feet in the long jump, respectively. Nguyen also holds the BGHS school record for the long jump at 18'10.75" which is currently the best mark for long jump in Orange County this year. 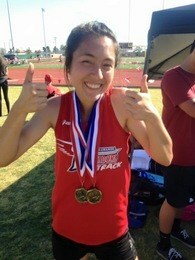 Janel has held a love of track and field ever since she was a little girl. 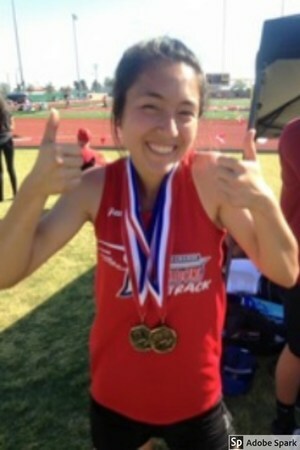 Inspired by women in track and mentored by her parents (also track and field athletes), Nguyen has worked tirelessly to perfect her sport and follow her athletic and academic dreams. Janel will attend Colorado State University-Pueblo in the fall on a track scholarship, where she will begin her studies in Physics as well as continue her pursuit of track and field. She hopes to eventually work for NASA.